When do I send my thank you cards? 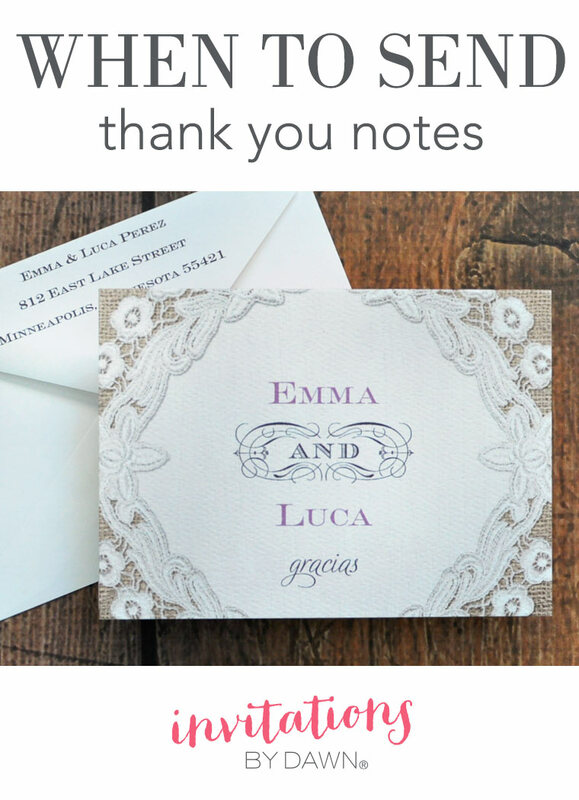 Wondering when to send thank you cards after the wedding? Here’s a quick rundown from Invitations by Dawn plus a few tips for keeping you on track. It’s highly recommended that you purchase thank you cards at the same time as your wedding invitations. We recommend placing this order 4-6 months before the wedding. Then you’ll have your thank you notes in time for any early gifts you might receive. However, the majority of your gifts will be given the day of your wedding so you’ll have quite a few thank you cards to write even if you get an early start. We suggest writing a chunk of thank you notes every night for a couple of weeks after the wedding or when you return from the honeymoon. It’s better to take your time and remain sincere in your wedding thank you wording than to rush through and be generic. If you’re not sure how to write thank yous, read 5 Steps to Writing Thank You Notes and you’ll have no problem finding the right words to share your appreciation with friends and family members.